Green Solid Colour Design Pashmina. High quality design Pashmina, with soft, light weight Twill Weaved 52% Acrylic 48% Viscose Fabric – very warm for cold evenings. Large orange coloured Fair Trade pashmina wrap/ scarf, excellent quality hand woven plain twill weave made from a superior quality yarn. Weight approx. Gorgeous Golden Orange Fine Woven Silk/ Wool Blend Pashmina/ Oversized Scarf. Condition is Used. Although the label is no longer on this pashmina I can assure you it is excellent quality and a mix of 50% Wool and Silk. I f you buy this and are unhappy with its quality I will gladly take it back. The colour is unusual and I would describe it as the near to the Harri Krishna orange a golden orange and it contrasts well with a lot of shades dark and light. It measures 27 inches wide by 84 inches long with a 3.5 inch twisted and knotted fringe. It is in good clean and ready to wear condition having been hand laundered and line dried. Our Pashminas are very high quality, have zero defects, and are substantially better quality than Pashminas sold through many of our competitors. They are very soft to touch and warm. Our pashminas are very high quality and are substantially better quality than shawls sold through many of our competitors. Colour - Peachy Pink with Cream Fringe. 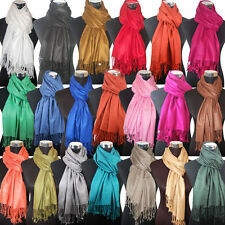 Ladies Pashmina by Atmosphere. By espirit designers logo at hem. Pashmina shawl wrap in red to purple ombre Dip dye. Crinkle fabric- so no ironing ! Photos don't do this shawl justice. Fashion scarf. 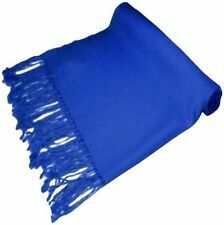 Fabulous Fine Woven Nepal Made Silk/Wool Pashmina in Sky Blue by The Cashmere Co. Condition is Used. This is a fab quality pashmina that you can use all year round either as an oversized scarf in the winter or a pashmina in the summer. It is a blend of 50% Silk and Wool. A great colour that will contrast with most shade light and dark alike. It measures 27 inches wide by 84 inches long with a 4 inch twisted and knotted fringe at each end. It is in good clean and ready to wear condition having been hand laundered and line dried. PASHMINA LADIES PRETTY PINK SCARF. IT'S MADE FROM A LOVELY QUALITY SOFT MATERIAL IN A VERY ELEGANT STYLE ♥. Colour as picture show. It is very easy to do that. Ivory Chiffon And Silky Shawl/Pashmina/wrap. Condition is Used only used once 20 inches wide and 72 inches long Chiffon material with silk material both ends and trim. Perfect for a wedding Uk postage only . Dispatched with Royal Mail 2nd Class. Selling 100% high quality shawl. for more informations & pictures contact me! Choose from this array of unpatterned rectangular pashminas. These unpatterned pashminas have simple designs, ensuring that your look is put together. With a traditional appearance, they will always be on trend. They have a fashionable design, keeping you up-to-date with the latest trends. Rectangular pashminas have an easy-to-wear style and are designed in different lengths, giving you a wider selection to choose from. Orange pashminas have lively and cheerful shades, so there is a wide selection of options. Adding a pop of colour to any look, these pashminas are great for when you're ready to make a fashionable statement. A highly popular choice, grey pashminas will stay fashionable for years to come. They come in neutral hues and are easy to match, giving them added versatility. 100% lambswool pashminas are the ideal wintertime accessories. Lambswool provides ultimate breathability, allowing you to go about your day in complete comfort. Elegant and timeless, 100% silk pashminas are wonderful for accessorising your outfit. They have a delicate finish and a luxurious style, adding a hint of elegance to your wardrobe.